Why suffer at the hands of spine chilling tap water in the winters when you can have hot water supplied instantly. Get this conventional range of Activa metal instant geyser that will give you hot water supply in a few minutes of switching on so can do your work with ease. The geyser is perfect for single person usage and has a 10 L Capacity. If you have hard-water supply in your region Activa metal instant geyser has a power-efficient magnesium anode will take care of it for years to come and give instantly hot water. Its extra thick and capsule-type inner tank is made from stainless steel that ensures the tank remains rust free and gives pure water supply. For smooth and uninterrupted water supply it runs on anti-vacuum system. This compact and mini geyser with warranty of 1 year on electrical components and 2 years on inner tank ensures you get a quality service for the prescribed period. Buy this affordable range of efficient geyser from and get timely doorstep delivery. # Capacity # Get this geyser with 10 Litre Capacity geyser from the house of Activa that will give you instant hot water after minutes of switching on. It works best for single person usage and is easy to install. # ISI Marked Heating Element # Safety comes before comfort which is why the Activa metal instant geyser has been incorporated with a high quality and ISI approved heating element. This element is extra heavy to ensure durability. The geyser also comes with a thermostat and power-cut out. # The inner tank of this geyser is made from stainless steel of the highest grade. This ensures that the tank remains safe from rust and is able to store and supply pure hot water. # Body # Activa metal instant geyser has been given a processed powder coated sheet metal body along with top and bottom made from high grade plastic for durability. # The geyser with automatic thermostat regulates water temperature and a built-in pressure release valve for adequate and regulated water flow. # The geyser has a power consumption of 3000 watts which ensures you get instant hot water supply after switching on. 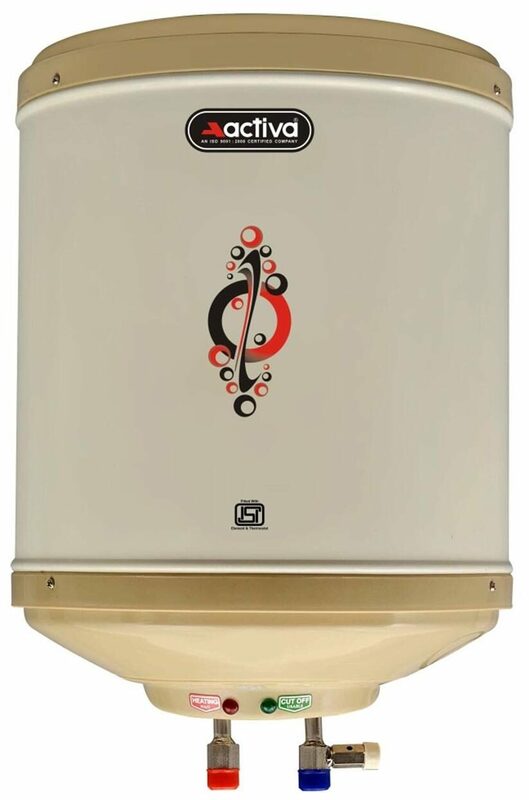 # Warranty # Always go for a geyser with warranty of a considerable period as this affordable range of Activa metal instant geyser. It comes with a 1 year warranty on electrical components and 2 years warranty on tank of the geyser. # For warranty Please contact below given Number from Sunday to Friday (9:30 AM- 6:30 PM) # 9555000247 # The images represent actual product though color of the image and product may slightly differ.